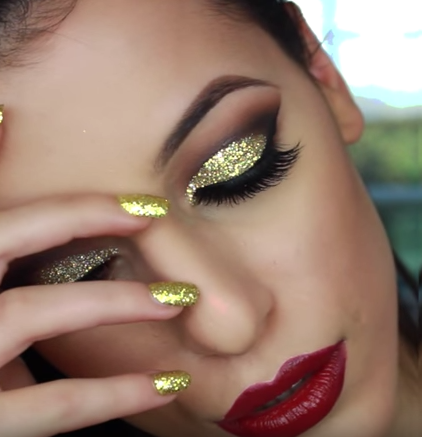 Five gorgeous gold glitter cut crease smokey eye ideas to emulate! We have heard of smokey eyes, and the look can be emulated in many ways. But have you ever tried cut crease eyes, which seems to be the latest eye makeup trend doing the rounds. And more so, cut crease eyes with gold glitter? With the holiday season and the party mood that is on in full-swing, let’s take a look at a couple of ways to wear cut crease gold glitter eyes. Begin with washing the eyelids on each side with a shade of neutral brown. Then take a smudge brush and very gently on the crease line apply a darker shade of matte brown, all the way to the outer corner of the eyelid. With the help of a dark pencil, draw on the crease line an arch from the inner corner to the outer corner of the eyelid and then use a brush to smudge the eyes. Now apply a lighter shimmer shade of brown which has warm red tones in it on the eyelids within the cut crease that has formed. For the final touch, dab a generous amount of gold glitter within this pigment and blend. Apply kohl and mascara, and wear false eyelashes if you want. 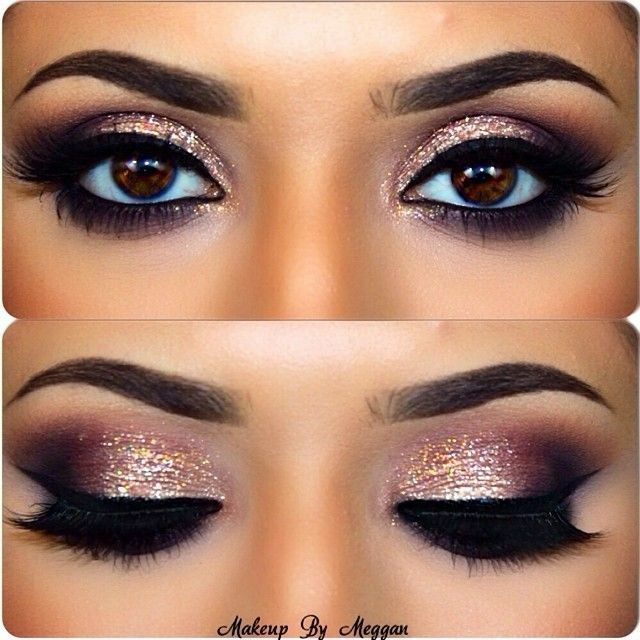 For the gold glitter smokey eyes, we shall follow the eyewash routine to begin with, using a brown matte shadow. For the areas under the brow bone and the inner corner of the eyes, we shall dab a touch of peach and blend into the lids. For the crease line, we shall take a dark pencil and draw an arch from the inner corner to the outer corner of the eyes, and smudge with a brush. 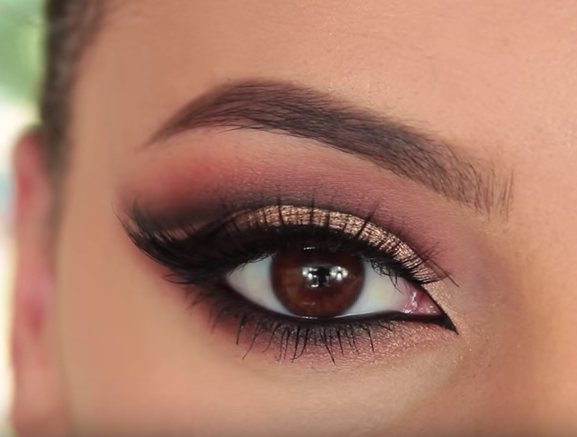 Just above the crease line, we shall use a dark brown shadow and smudge into the crease line. 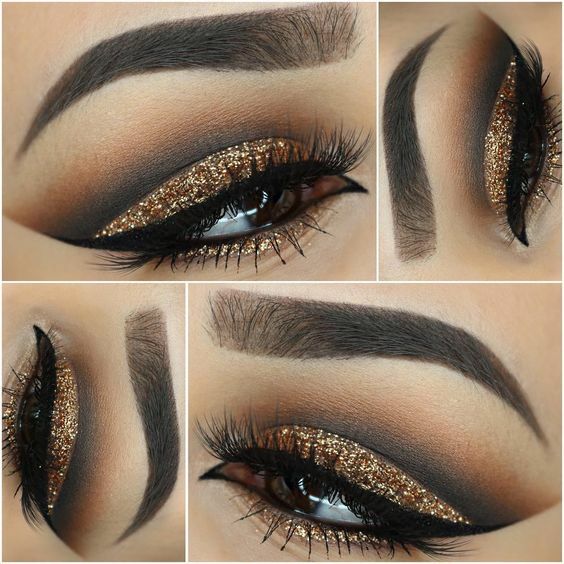 For the final look, a dab of gold glitter shall be used to deck up the eyelids below the crease line, and a little space to add more dark shadow to smoke up th eyes below the crease. Heavy mascara and dark winged kohl completes the look! Keeping in lines with the winterish themes and colors, we shall use plum shades and golds together to make a sensual party look come through, or a wedding reception look. We shall begin with an eyewash using neutral brown matte tone shadows. A black pencil would be used to form an arch from the inner corner of the eyes to the outer corner, and on top of that a shade of plum shimmery eye shadow in one stroke. Smudge the lines well and form a crease. Below the crease, dab a generous amount of gold glitter. Highlight the brow area with white and peach shades. Dark mascara and kohl for the lashes and the lids are a must. Minimalism is what we love, and we can have that in golds too. To begin with, start with an eyewash in neutral brown shades, and then move on to draw a crease line arch with a brown pencil. Minimalism means to have a subtle touch and nothing short of the same. 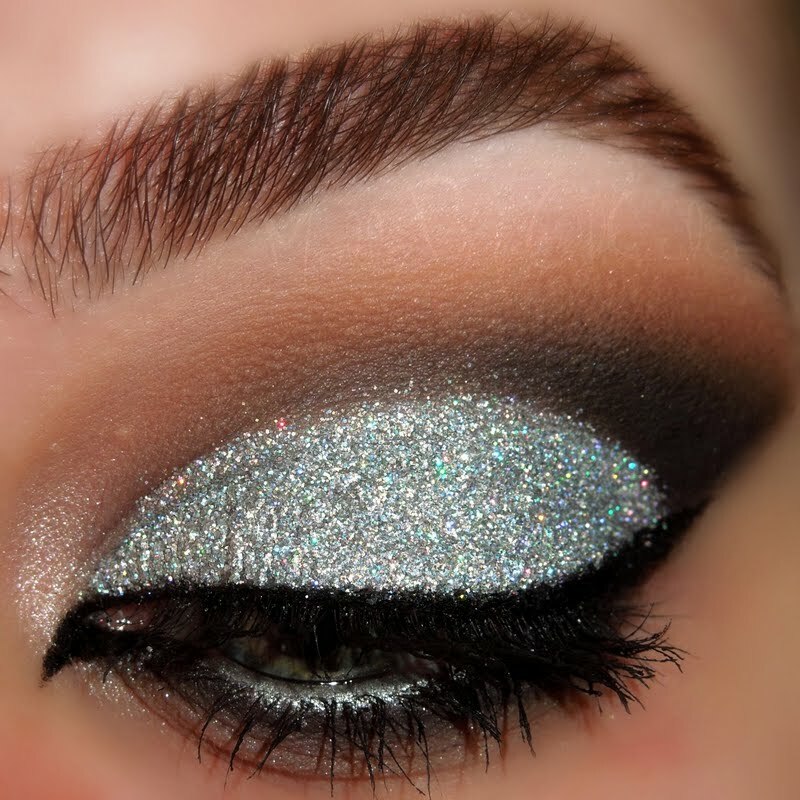 Once the crease line is drawn, wear your gold glitter below the crease and apply dark kohl liner to complete the look. To highlight the brow area, we shall use peach, and a dark line of kohl is more than enough. For the lovers of all things matte or for those that love the gold cut crease and would want a subtle touch for the day time look, here’s an idea. Draw a crease line with a brown pencil and smudge the arch inwards onto the lids. 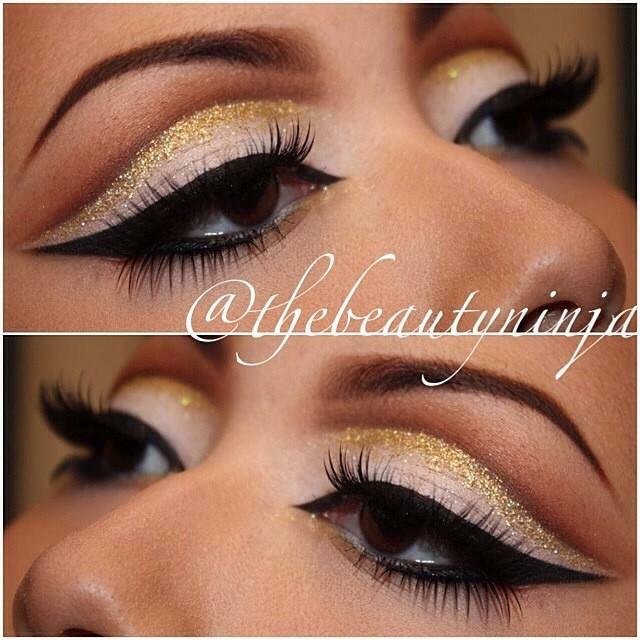 Under the crease line, wear your light shimmer gold with a dab of glitter in gold and smudge well. From the brow bone to the outer corner, wear a line of black shadow, and smudge it outwards. Contour the outer corner of the eyes with black pencil and smudge to perfection. Complete the look with heavy mascara! We hope you try these five ideas soon and let us know how it went!